Robert Sherrill's pathbreaking 1990 exposé of the savings and loan scandal sheds light on John McCain's deregulatory politics--and our current financial crisis. 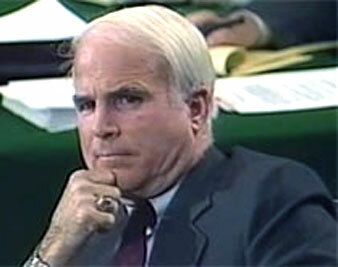 John McCain in 1990 during S&L hearings. The section on jailed Lincoln Savings & Loan magnate Charles Keating is particularly memorable. “If any one hustler was the living symbol of the underlying rot of the savings and loan industry as created by Congress and Reagan’s biography in the 1980s, it was Charles Keating,” Sherrill writes. Sherrill’s pathbreaking reporting sheds light on all that was wrong with the deregulatory politics back then–as well as on what has fed our current financial crisis. It’s worth a second read: “S&Ls, Big Banks and Other Triumphs of Capitalism,” from the November 19, 1990, issue.